Click to viewYes, you know they help to digest your food and culture your yogurt. But were you aware that bacteria like E. coli and lactobacillus can now have the ability to decimate cancerous tumors, detect stress points on airplane wings, clean your clothes, and fuel your car? Discover Magazine published a summary of ways that genetically engineered microbes can make human life easier, and the research that's bringing those possibilities to light could make anyone optimistic. 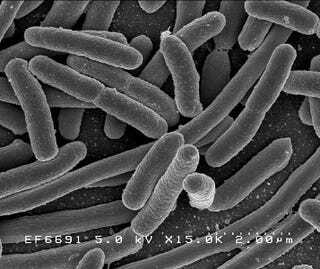 10 Ways Genetically Engineered Microbes Could Help Humanity [Discover Magazine] E. coli image from Wikipedia.